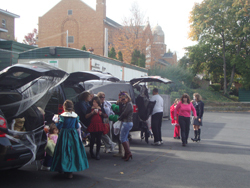 The first annual Trick-or-Trunk Halloween celebration on the Assumption School parking lot was a huge success this past Saturday! The parents of our school students decorated the trunks of their cars in a myriad of ways. 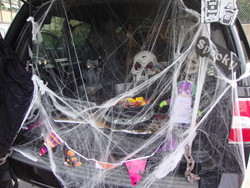 Children were treated to the sights and sounds of Halloween including Frankstein's Laboratory, a graveyard and enormous spiders. Families hand out treats while the kids parade around in their costumes. The members of the school FSA also prepared hot chocolate for all kids and their parents. At 2:00 sharp the Pastor and Chief Administrator of the school Fr. Ivan Turyk, gave signal and all children present began their trick-or-treat journey from car to car gathering candies. The event provided a safe family environment for trick or treaters. Calendars are already being marked for this event next year.